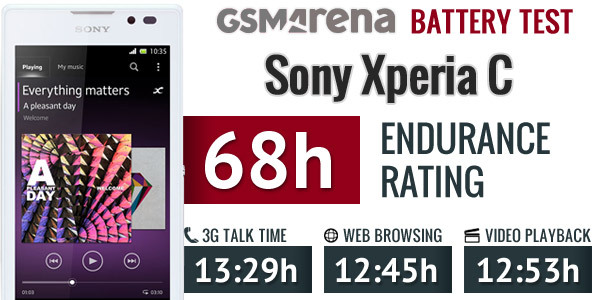 Now that we are through with our Sony Xperia C review, we took our time to detail its battery test routine. The Xperia C runs on a low-powered quad-core Cortex-A7 processor and relies on a 2,390mAh battery unit. Even though it has a big screen to light up, we still expected some good scores because of its efficient chipset and relatively low resolution. And we weren’t disappointed. Out first test, as usual, is all about 3G calls. 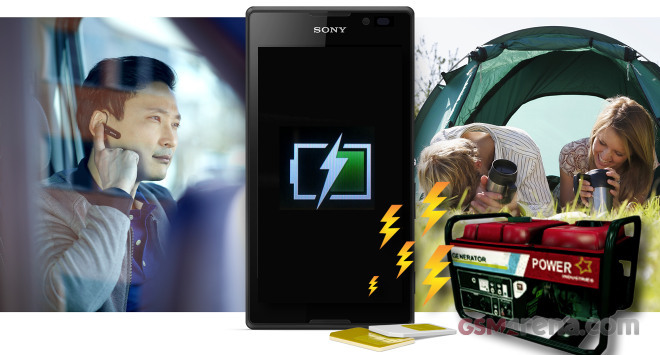 The Xperia C managed to last 13 hours and 29 minutes before its battery ran out of juice. The score isn’t among the most impressive results we’ve witnessed, but it is a lot better than other dual-SIM droids we’ve seen. The web browser test is where the Xperia C beat every other device we’ve tested so far and took the first place in our chart with its 12 hours and 45 minutes endurance. The lower resolution screen and low powered processor surely helped, but there is another reason as well. It also worth pointing out that do our browser and video tests at the half-way brightness setting and the Xperia C behaved somewhat strangely. When the slider was in its middle position the brightness was less than a quarter of the maximum available, which probably helped it here. The Sony Xperia C did great on the video playback test too. It outlasted all but six smartphones in out chart and its battery was enough for almost 13 hours of video playback loop. The same concerns as with the web browsing test apply though. Sony Xperia C is a dual-SIM and dual-standby smartphone and yet it offers amazing standby performance. It helped it score an overall endurance of 68 hours, which means you’ll only need to charge the smartphone every 3 days if you use it for an hour each of talk-time, web browsing and playing video per day. Quite an impressive result indeed. If you want the full scoop, take a look at our detailed review of the Sony Xperia C.